I'll admit it upfront: I'm not sure what to make of this beer. It's a bit of a riddle. Why? let me explain. 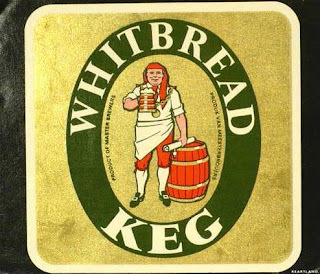 Whitbread started brewing IPA around 1900. With a gravity of 1050, it was the weakest beer in their lineup. By the 1920's, it was just 1037. It remained at that strength until 1941, when something weird happened. They made a few much stronger brews with almost double the OG of the normal version. What were they up to? It's even more bizarre because this is just when WW II was starting to eat away at beer gravities. All the other beers in Whitbread's range were getting weaker. Why suddenly double the strength of IPA? I'm at a loss to explain it. Any suggestions are welcome. Maybe they'd read the style guidelines and wanted to brew an "authentic" IPA. Now over to Kristen . . . .
Ok guys, back to WWII for a bit shall we. The tremendous changes in 'war' grists and overall beer profile is very interesting to me. All the changes that needed to be made to the recipes in order to brew something similar to what people were used to. A massive increase in the use of older malts, especially non-domestic, has been a theme in all the logs I've seen over every brewery. Hops are similar but not until towards the end of the war did you really see any striking difference. Today's beer is an IPA brewed by Whitbread in 1941. One of the most interesting things to me about this beer is that its is quite strong for the time. When IPAs were clocking in around the mid to high 1040s this beer is nearly 1070. Not to mention a very liberal hand with the hops. Next week I'll do that beer right next to this one in the log. Whitbread's weaker IPA. Very neat stuff. Two IPA's of different strength, grist and hopping levels so you'll be able to compare. Every single line in the log indicates that all the base malts were old and of 'number 2' quality. Nothing really fresh went in to this beer. Quite a good dose of crystal malt went in which would have added a definitely caramel/ toffee character. The nearly 10% invert sugar would have gone a good way in drying this beer out. Don't go messing about trying to find old grains. Just make sure and use a few different ones. As always, the 6-row isn't mandatory so do pull your hair out if you can't source any. Your best bet would be to switch to a pils type malt. Invert your own sugar or simple white table sugar, beet or cane work the same, is fine. The mash wasn't entirely typical for the time. Rarely have I seen a mash with this many infusions for this period. That's not saying there they don't happen, a simple single infusion is more the norm. Whereas a few years prior, the boil would have been 2-3 hours it gets dropped down to just over an hour. Lots of ways breweries were trying to save money and this is an easy one. A simple mash of around 150-2F would have a similar effect. The hops are quite old on the whole but the average alpha acid percent wasn't to low. There was a bunch of different Golding-type varieties. East Kent, Mid-Kent and some Worcester Goldings all mixed of different ages. At nearly 3# of hops a bbl, this was quite a strongly hopped IPA. Definitely would have had a lot of the tannic, strong tea character and lots of spice. A good portion of dry hops would have definitely been added at around 14-15oz per bbl. Most important thing in this recipe is that you use hops that are of lower AA% in order to get the effect of all the 'green stuffs' in this recipe. Right around 65F will do just fine. Keep it cool and the choice of yeast is up to you. Whitbreads two strains are readily available and will give a more characteristic' flavor. However you can use whatever you like. I would suggest that you stay English as the yeast has more character than the bland US ones. Herbal spice, resiny floral hops. Caramelized apples and pear. Biscuits and bread crush. Hints of husky grain. Crisp and drying finish with a mouth drying astringency. I could have been a happy accident. Someone at the brewery noticed a few bags of old malt gathering dust and, since there weren't enough of them to make a whole batch, thought about adding them to their IPA. Pivni Filosof, whatever it was, it wasn't an accident. Brewers couldn't just brew something on a whim during the war. And raw materials were rationed. "Whitbread's two strains [of yeast] are available . . ."
What are the two strains to which you refer? I have only ever used the Wy'east "Whitbread" strain, and was not aware of a second. Thanks for the time and research. Many of these old recipes describe some wonderful beers, and the service the two of you are doing to bring these to light is of utmost value. My personal favorite thus far is the 1914 Courage X; I've brewed it twice, and could happily drink nothing else for several months on end. Mark, nothing makes me happier than hearing people are brewing these recipes. If only I could get hold of an Edwardian Mild. Wyeast 1098 and 1099 are both whitbread strains. The Safale S04 is the whitbread dry. Mark, nothing makes me happier than hearing people are brewing these recipes. A whole lot more people are brewing these recipes than you can imagine...it's all good. Thanks Kristen, I follow you both . ... perhaps PM winston churchill wanted to provide some of his fellow citizens and troops with a big beer? after all, HE could have "made things happen". did any of this stuff get sent overseas to british army, navy or RAF bases? seems to me, it would have been a great morale builder. beer guru, that was my first thought. That it was for some special purpose. I don't know if we will ever be able to discover the real answer. "Wyeast 1098 and 1099 are both whitbread strains. The Safale S04 is the whitbread dry." I though that Withbread where prolific bankers of different yeast strains they used. Is their any proof that there are descendents of the general stains they used? I don't know man, its a yes and a no. B/c of all the different brands they brew/ed they'll have many different yeast strains. If you've been reading our recipe stuff for a while you'll remember that a lot of breweries were very polygamous with their yeast and got a bunch of different yeast form different breweries for making the same beer in the same year. There are very few yeasts were one can trace lineage...Courage to Timothy Taylor is one. We do the best we can with what we have. To your question, I think the Wyeast 1099 and the dry SO4 are the more current yeast whitbread uses for their pale ale and the like. Lastly, back to the point about yeast polygamy. Find an English yeast you really like and experiment. If they did it at the actual brewery, why can't you? I would suggest that you stay English as the yeast has more character than the bland US ones. How are US ale yeasts bland? Sure they don't throw out a lot of esters or diacetyl like British yeasts but I wouldn't call them bland. They accentuate both hop flavour and malt flavours which is something that British yeasts fail to do. I should also not that US ale yeasts actually originated in the UK. To use such blanket statements as the one above is purely naive. A yeast is 'bland' if it has not character in and of itself. Sierra Nevada's yeast is a blank canvas that you can really us for anything. Its so 'bland' and clean that I've seen breweries use it for lagers. This yeast is the yeast I used for the entire first year I ever brewed...it is bland...but thats the entire point. British yeast accentuate both the hop and the malt in beers. I have no idea what you are talking about. Some do it together, some individually. I've used nearly every commercially and availible yeast on the market so I do know what I'm talking about. For these recreations, I suggest English yeast BECAUSE these beers are English and were made in England. Tim, I ask you, would you have had a problem if I told people to stay away from Belgian yeast for these beers? I don't think so. I can't think of one White Labs or Wyeast strain that is marketed as 'British" that promotes both hop and malt profiles. Also your note on Belgian yeasts is also a little ignorant. Belgian beers are normally fermented at elevated temperatures (up to 30 degrees). It's the ferementation temperature which leads to the character of Belgian beers rather than the yeast itself. Belgian Ale yeasts fermented at lower temperatures produce pretty clean beers. Kwak is a prime example, actually its rather similar to a British ale, or an American brown ale for that matter. Tim, I don't think you get it. For a yeast to promote non-yeast-dereived flavors, it has to play second string. Your argument is like saying that the steamed white rice under your curry makes the curry taste more curry-like. It doesn't work like MSG where it makes the food taste more food-like. See how that doesn't make sense? The malt and hop flavors are there all along and rather than play together, American yeast hangs out in the back making alcohol. Why can you not comprehend that Safale-05, WLP-001, Wyeast 1056, is an English strain??? It was given the name American Ale for marketing!! No, it doesn't produce a lot of esters or any detectable diacetyl, but not all English strains do. Do you think Nottingham is also a US yeast?? Bottom line: The origins of 1056 are English. You can believe whatever makes you happy. I've said this before so I'll say it again. For our purposes, when I say 'English strain' I mean one that has predominant English character. When I say American, German, Belgian, etc etc. The character typical of those strains on the whole. This is not a point to nitpick about. We want a certain character and I don't care if you call it French as long as you use a yeast that has whatever character we need. I will indicate a certain breweries strain, as always. I'll be more specific from now on so people don't get confused about the word 'English' or 'American'. @Kristen - Wyeast 1272 American Ale II is a pretty fruity yeast, throws up plenty of esters and is anything but bland. @Adrian - My point was yeast funtion at different temperatures. S05 is unique in that it does accent both hop and malt flavours. It doesn't make it bland. Dry hops for KK Bott. Scotland 1 England 0 ?